How Did the Tiger Get its Name, What Does it Mean in Greek, and Where Do They Live? The tiger is a member of the Felidae family and the largest and possibly most dangerous of the four “big cats”. Tigers can be found in eastern and southern Asia, and is a predator and carnivore, reaching up to 11 feet in length, and weighing up to 660 pounds. One of the most recognizable features of tigers is the pattern of dark vertical stripes on top of white to reddish-orange fur. 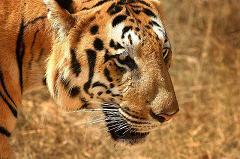 The Bengal tiger is the most numerous tiger subspecies and the largest is the Siberian tiger. The word “tiger” comes from the Greek word “tigris”, which probably originated from a Persian word meaning “arrow”. The English word “Tigress” was first documented in 1611. The tiger’s scientific name, Panthera tigris, is usually assumed to come from the Greek words pan-, meaning “all”, and theron, meaning “beast”, but this is likely a myth from folk etymology. A group of tigers is called a “streak” or an “ambush”, although it is a rare sight. Tigers are among the most recognizable big cats, and are popular in ancient mythology and folklore, and continue to be depicted in modern art and literature. Tigers also appear on many flags and coats of arms, as mascots for sporting teams, and is the national animal of India. How did the Nurse Shark get its Name, Where does it Live, and How Big do they Get?